Bone Dry Musical Instrument Co. Antique washboards for traditional folk percussionists. Featuring the legendary Zinc King #703, the rub board serious rhythm artists long for and desire. Over 200 Sold! We constantly scour the planet for these boards. If sold out, click "Email me when Back-In-Stock" link to get notified when a board enters the inventory. (Link is below "add to cart" button on product page.) You might also check the Bargain Bin. Midget #442 washboard. More alternative washboards to come. Watch for updates in monthly newsletter. Zinc King #703 Washboards Bought and Sold: Immediate cash paid. 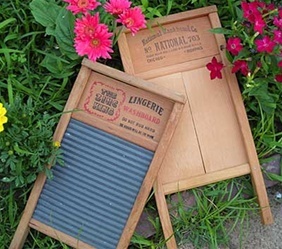 Do you have an old Zinc King Lingerie washboard lying around the house collecting dust? Contact me now to replace that clutter with instant cash. The "Stradivarius" of musical washboards. This is "the Stradivarius of musical washboards," says Grammy award winning songster, storyteller, and multi-instrumentalist, David Holt. He should know. After all, his Folk Rhythms DVD is the definitive video for learning how to play the washboard (plus bones, spoons, hambone and even the paper bag). David Holt learned to play the washboard from 123 year old Susie Brunson. "She said this was the only instrument they had in the black community of Bamberg, SC when she was a little girl in the 1870s. Susie was very insistent that most of the rhythm was made with tapping rather than scraping." David Holt is talking about our model #703. And although some washboard artists prefer larger models, "The size of the washboard," he insists, "does not improve the sound." So just to be clear, washboards come in two basic sizes: Large and small. The Zinc King Lingerie #703 is a small pail-size washboard. What Makes This Washboard So Special? The ribbed and textured surface produces a full rich euphonious sound. Unlike other boards that are shrill or ringy, the timbre is relatively mellow and understated (at least for a washboard). I suppose the galvanized (zinc coated) metal, which is probably tin, must be largely responsible for the distinctive warm tone. The two wooden panels on the backside form an enclosure behind the zinc rubbing surface. This creates a resonating chamber that adds tonality and helps drive the sound - kind of like a drum. Model #703 is one of the few washboards that sport such a chamber. The frame design is elegantly simple and compact. The metal rubbing surface floats - and resonates - within a deceptively simple tongue & groove and rabbeted framework. So the entire unit is amazingly sturdy yet flexible. That's why the whole darn structure rattles when you play it. And it is all secured in this vibratory state with just four small strategically placed nails. What's more, no elements stick out, fall off, or snag at you. Which Washboard Grade is Right for You? Every Zinc King #703 washboard we sell is a fine playing vintage instrument. All parts, including the two back panels, are intact and in good working order. For all practical purposes each washboard plays just as well as the next. The difference in price merely reflects the outward appearance of the wood, the rubbing surface, and the ink. Washboards in all grades below are antique objects that might show signs of age, wear or inconsequential damage such as small chips, water staining and paint spots from long term storage or display. Light wear. Hardly used. Little or no corrosion. Ink color and print quality usually good, but not always. Might show signs of age and wear from storage or display. Appears unused. Ink color and print quality usually good, but not always. Might show signs of age and wear from storage or display. Belongs in a museum. Don't know why you would want to scrape up a fine antique relic like this to play music on it though. The wood on vintage washboards is bone dry and brittle with age. So avoid hammering nails or tacks into the washboard because the wood is likely to crack. The safer way to add accessories and hardware is to drill holes with a sharp wood-cutting bit, then attach with bolts (preferably) or screws. The weathered ones cost less, the clean unblemished ones cost more. © Copyright 20165 Bone Dry Musical Instrument Company. All Rights Reserved.